Louise Hay has created this privacy statement in order to demonstrate her firm commitment to privacy. The following discloses her information gathering and dissemination practices for this Web site. The Louise Hay online e-newsletter asks users to give us contact information (like their name and e-mail address). This information is used to contact the visitor when necessary about special promotions, and discounts, and is never divulged to third parties. This site contains links to other sites. 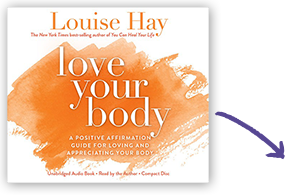 Louise Hay is not responsible for the privacy practices or the content of such Web sites. You can unsubscribe or update your subscription preferences at http://unsubscribe.hayhouse.com. If you have any questions about this privacy statement, the practices of this site, or your dealings with this Web site, you can contact Hay House at http://www.hayhouse.com/contact.